Why can’t I move songs? Guitar chord forum - chordie → About Chordie → Why can’t I move songs? Topic: Why can’t I move songs? I’m having a horrible time trying to move songs from one songbook to another. After I hit the “move” the drop down does not allow me to choose another songbook. HELP PLEASE??? Re: Why can’t I move songs? You have to select the song/songs that you want to move first (tick box to left of song title). Oh sorry - already did that. Four times actually. Any other suggestions? Sorry, you are right. Not wanting to actually move a song I did not try to complete the operation before my previous reply. There does appear to be a bug here so I have reported it to Per who will no doubt sort it as soon as he gets time. That is weird.... I move songs all the time. I just did it a minute ago to make sure it was working. I just check the box of the song I want to move, then go to the little plus sign with arrows that says move song. choose the destination songbook, click OK and volia! it is moved. I have no problem whatsoever doing it. are you trying to move a song from one song book to someone else's? that might be a problem. I think it has to be from one of your own songbooks to another of your own songbook ! but then I cannot change what songbook to move it to nor move to the "Temp (79)" shown. 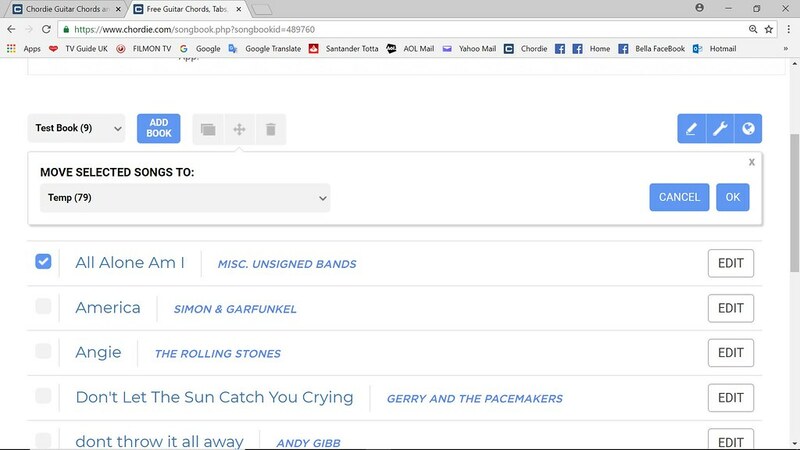 I can click on the arrow beside "Test book (9)" to select another songbook and move away from this page but nothing within the actual 'move song' contol box works. It worked for me too. If you are still having problems try down load cleaner from : cleaner.com and be sure you pick the free version. I it rated as the best and one of the most used. Pamesposito, do you have any apostrophies or anything other than letters and numbers in your song books name? Apparently this can cause a problem and as mine is "Roger's Songbook" it is causing my difficulty. No the songbooks all have letters except - ironically- the only numbers are the numbers of songs actually in the book! Such as BLUES(21) hope this helps! OK thanks I will pass this on. ummmmmm the parentheses Blues (21) maybe ??? ?